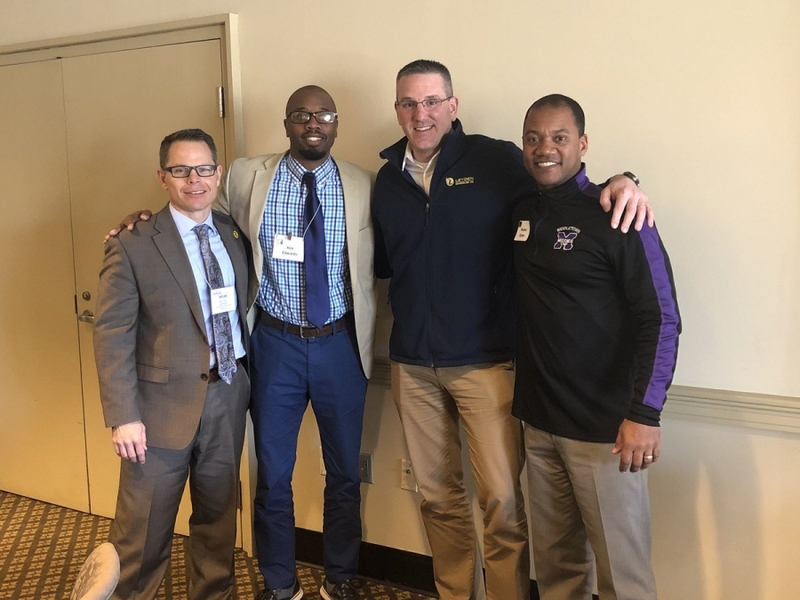 Pictured (L-R): Dr. Brian Troop, Kee Edwards, Nick Polyak, and Marlon Styles, Jr.
Marlon Styles, Jr., Superintendent at Middletown City School District (MCSD), and Kee Edwards, Principal at Miller Ridge Elementary in MCSD, were among the nearly 40 school district administrators who traveled to Pennsylvania to get a firsthand look at a student-designed media center, a MakerSpace and a MakerBus as part of the AASA Digital Consortium, March 3-5, at the Ephrata Area School District in Ephrata, Pa.
“Our visit to Superintendent Troop’s school district allowed us to view digital learning in action and how it empowers faculty, staff and students to drive change about learning. To strengthen public education, we need to redefine, redesign and reimagine what we can do for our kids,” said Styles. The meeting was hosted by The School Superintendents Association in partnership with Microsoft. Through the Ephrata Area School District Journey, educators learned about inspiration, research and work completed to develop and implement a “profile of a graduate” during the Consortium’s first meeting of the year. The meeting concluded with a visit to the Franklin Institute in Philadelphia where educators participated in activities and a discussion about understanding how a student’s brain is engaged in class. “Professionally, it was rewarding to attend this meeting with Mr. Styles and to see an array of examples of what we mean when we talk about the digital revolution and Middie Modernization Movement,” said Edwards. Attendees heard from high school and middle school students who worked alongside teachers and local professionals to transform a donated school bus into a MakerBus, from the interior fabrication and construction to the exterior design. Launched in 2014, the purpose of the Consortium is to support school district administrators as they scale successful models of effective learning experiences using digital media and innovation to be a leading national voice in our nation’s public schools. Last fall, Digital Consortium superintendents visited Ohio’s Avon Local School District, where they had a firsthand look at how the school system’s partnership with local businesses and a community college is mutually benefiting students and local employers. Read “The Cleveland Triangle: A Booming Partnership Between a School District, Local Businesses and a Community College” to learn more about the meeting. In addition, watch a short video containing highlights of the gathering. For additional information about the Digital Consortium, visit the AASA website, which includes recently produced case studies featuring several members. Superintendents and other educators can also contact Mort Sherman, AASA associate executive director, leadership network, at msherman@aasa.org, or Debbie Magee, program manager, at dmagee@aasa.org.